... Meanwhile, as to I-69, a federal Record of Decision has been received for the 120-mile Segment 11 from Benoit to Robinsonville, and Tagert was asked by local engineer Cecil Sowell what the schedule was for moving ahead. The plain answer is, there is no schedule, said Tagert, because "we need to have a federal transportation re-authorization bill" to revive funding. "I'm looking forward to seeing it built, but there is no committed funding for it today... "
"I-69" SIU 9 in MS is complete; the initial groundbreaking for "I-269" SIU 9 in MS from the TN state line to MS 302 will take place on June 23 (Mississippi's "I-269" SIU 9 also includes three other projects that are each expected to begin in two to four years, and completion of all of "I-269" SIU 9 in Mississippi is currently expected to be around 2020); [there is a separate "Interstate 269" thread on the Southeast page http://www.aaroads.com/forum/index.php?topic=1329.50]. From the intersection of I-55/I-69 just south of Nesbit, I-69 runs west towards Tunica (Robinsonville)(shared route with MS Hwy 304)". The unveiling of the “Future I-69” signs on the U.S. Highway 61 Bypass signals that Clarksdale will become part of the interstate system stretching from Canada to Mexico, Northern Highway Commissioner Mike Tagert observed Friday. To sum it up, not much should happen on SIU 11 in near future: I suspect most, if not all, of I-69 Corridor work in MS in near future will be along "I-269" SIU 9; however, maybe reauthorization bill and/or innovative financing study will jump-start progress on SIU 11.
" ... Meanwhile, as to I-69, a federal Record of Decision has been received for the 120-mile Segment 11 from Benoit to Robinsonville, and Tagert was asked by local engineer Cecil Sowell what the schedule was for moving ahead. The plain answer is, there is no schedule, said Tagert, because "we need to have a federal transportation re-authorization bill" to revive funding. "I'm looking forward to seeing it built, but there is no committed funding for it today... ""
I-69 is a new cross-county interstate that will connect Benoit to Alligator in District Three in the Delta region. The project is currently in the environmental stage. The corridor has been set and it is expected that the environmental document will be approved by FHWA this year. "I-69 is a new cross-county interstate that will connect Benoit to Alligator in District Three in the Delta region. The project is currently in the environmental stage. The corridor has been set and it is expected that the environmental document will be approved by FHWA this year." The Environmental Document for I-69 has been approved. Currently, surveying is being done for the design of the highway and right-of-way acquisitions are anticipated to start in one year. Meanwhile, as to I-69, a federal Record of Decision has been received for the 120-mile Segment 11 from Benoit to Robinsonville, and Tagert was asked by local engineer Cecil Sowell what the schedule was for moving ahead. The plain answer is, there is no schedule, said Tagert, because "we need to have a federal transportation re-authorization bill" to revive funding. "From the intersection of I-55/I-69 just south of Nesbit, I-69 runs west towards Tunica (Robinsonville)(shared route with MS Hwy 304)". With Mississippi's section of "I-269" SIU 9 currently planned to be completed around 2020, I became curious as to planned sequential process for SIU 11. Assuming somewhat normal federal funding, the SIU 11 FEIS indicates that SIU 11 would be rolled out over a nineteen year period and construction would proceed in roughly the following sequence: (1) 2016 - From current western terminus of SIU 10 to SR 4 interchange south of Tunica, (2) 2019 - Clarksdale to Cleveland, (3) 2020 - Tunica to Clarksdale, and (4) 2026 - Cleveland to Great River Bridge (Charles W. Dean Bridge). There is also a non-interstate grade widening of SR 8 from Rosedale to Cleveland scheduled for 2029. (http://sp.mdot.ms.gov/Environmental/District%201%20and%202/Archived%20Projects/Project%20Studies/I-69%20Section%2011%20-%20Robinsonville%20To%20Benoit/Executive%20Summary.pdf) [summary of progression is on page 9/18 of the pdf; page S-9 of the document]. The Preferred Alternative would include the widening of SR 8 from Cleveland to Rosedale. SR 8 would have a five-lane section extended west of Cleveland to a point west of the SR 8-Cleveland Interchange, where the roadway would transition to a four-lane divided section and remain this way until the eastern edge of Pace. At that point, the roadway would transition to a five-lane section through the built-up area of Pace. At the western edge of Pace, the roadway would then transition back to a four-lane divided section and remain this way to a point slightly east of Rosedale where it would again transition to a five-lane section and remain this way to the intersection with SR 1. For the I-69 Corridor in Mississippi as a whole (I-269 and I-69), it looks like there could be steady progress over the next twenty years. I will be very interested to see how I-69 alternative financing study being prepared by Atkins North America for AHTD will propose to finance construction of the Great River Bridge (Charles W. Dean Bridge) in SIU 12. Seems like in the most optimistic scenario the bridge is at the very least about 15 years away. Hmmmmm... which I-69 bridge will open first? Mississippi River or Ohio River? Where is the new Interstate 69 currently signed in Mississippi? I was looking at a Youtube video of a new portion of I-69 near Memphis, Tennessee...all of a sudden it shut down because of an error, but I will try to go back to it. Internet Explorer shut the video down for my safety, but I am wondering where the I-69 shields are appearing as of now? Re: Where is the new Interstate 69 currently signed in Mississippi? This link shows all of I-69 that is signed. Rumor has it that I-69 has been shortened again. I was just talking to Chris Lawrence and he says that the signs that announce the Start/End of I-69 have been moved back to the Tunica/DeSoto County Line once again (the original place) from the previous location @ the old MS-304 intersection area. Does anybody have picture proof of this? south of that interchange connecting the relocated SR 304 with the old two-lane section of SR 304. From the relocated SR 304 interchange to slightly north of the spur’s intersection with old SR 304, the design of the spur meets interstate standards. SIU 10 is open to traffic. It seems like the short stretch of I-69 in Tunica County is "legal" in the sense that it is part of SIU 10, which received a ROD several years ago. Also, I suppose it would now be "legal" if it were a part of SIU 11 because the ROD has been issued for SIU 11. Either way, I don't see the point of removing signage from the short stretch in Tunica County. MDOT's 2012-15 Draft STIP does not project much activity for the "non-I-269" part of the I-69 Corridor. 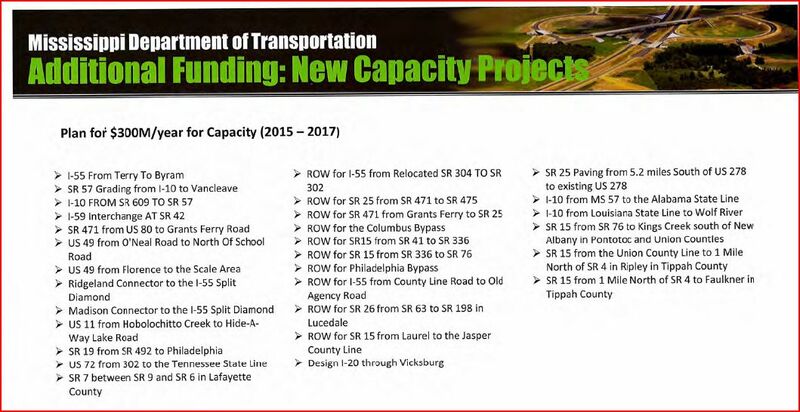 Basically, repayment of the debt service on the bonds for the paving of SIU 10 MS 304/I-69 from I-55 to US 61 is scheduled for 2012-15 (page 55/305 of the pdf). I did not see any scheduled projects for SIU 11 in Bolivar, Coahoma, or Tunica counties. Gov. Phil Bryant .... also supports for the proposed Interstate 69, which would parallel U.S. 61 from Tunica to south of Cleveland. Did anyone at the meet notice where the current START/END signage for Mississippi's current southern (western?) terminus of I-69 is located? Bryant also mentioned the impact of interstate highway running through the heart of the Delta. "The proposed Interstate 69 would make investments and opportunities available to citizens in northwest Mississippi," said the governor. "Our professional delegation is working hard to make sure adequate funding is passed along for highway development projects. I look forward to passing the Federal Transportation Act and I hope that it will include funding for the construction of Interstate 69." MAP-21 does not include earmarked funding for specific projects, including SIU 11. That said, it is important to remember that, as noted in this post in the "Interstate 269" thread, Mississippi is making rapid progress on its "I-269" part of the SIU 9 I-69 corridor and most, if not all, of I-269 in Mississippi will be under paving contracts in 2015. In conjunction with the I-269 projects, a 2016 letting for the first section of SIU 11 would still constitute great progress. 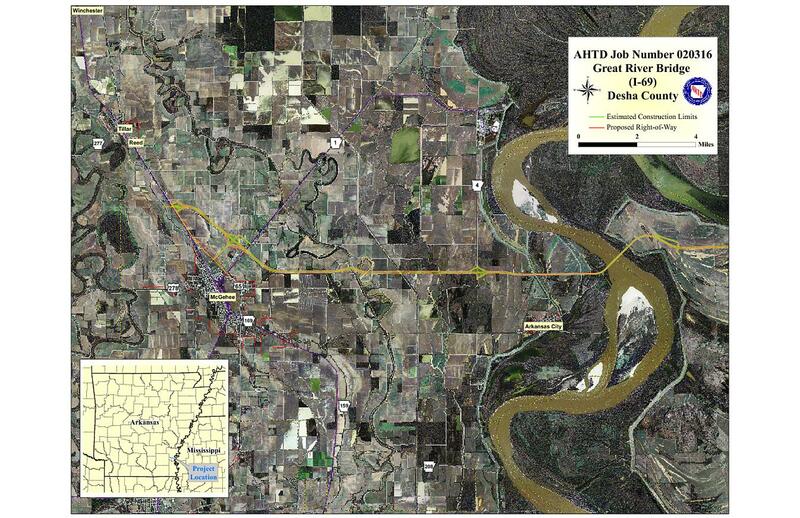 However, SIU 11 construction will to some degree require a coordinated effort with Arkansas in terms of the timeline for construction of the I-69 Mississippi River Bridge. Arkansas has a lot of big projects on its plate in addition to I-69 and minimal money to fund them. 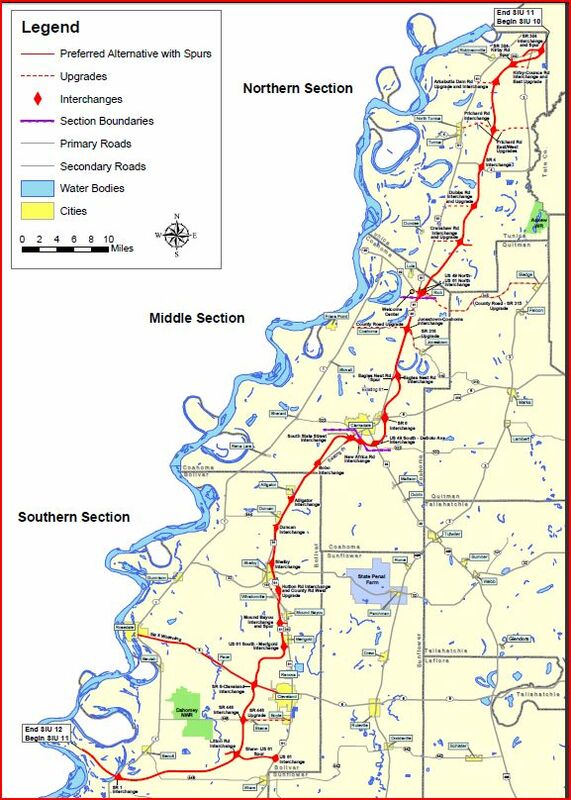 On the other hand, maybe SIU 11, in conjunction with the US 82 Greenville Bridge, will provide a useful corridor on its own and be reason enough for Mississippi to keep up the pace for SIU 11 construction. Should "Should I-69 Go Through Greenville, MS?" Question Be Revisited? maybe SIU 11, in conjunction with the US 82 Greenville Bridge, will provide a useful corridor on its own and be reason enough for Mississippi to keep up the pace for SIU 11 construction. When Mississippi opens their segment of I-69 near Greenville, what are the chances it will be signed as such? I'm hoping it becomes Bypass 82 so mainline 82 will remain through town. The Interstate 69 bridge’s close proximity to the new U.S. 82 bridge and its price tag — $715 million — raises a question: Why spend money on a new I-69 bridge at Benoit when there is now a completed interstate-grade bridge near Greenville? Wouldn’t it make more sense and save taxpayer dollars to have I-69, dubbed the “NAFTA Highway” and stretching from the Great Lakes to the Mexican border, cross the Mississippi River near Greenville as opposed to Benoit? The site of the Greenville bridge was never considered in the study for I-69 as it, too, sits between river bends. Plus, the Greenville site was unattractive to Arkansas. If Greenville had been considered, I-69 would have only skirted extreme South Arkansas, leaving no access to the rest of the state, particularly the Arkansas Delta. This left the two-bridge strategy. The new bridge at Benoit had to be built. And, Greenville had to have a new structure because of the transportation hazards to both river and road traffic posed by the old Greenville span. However, Arkansas currently seems to have I-69 as an extremely low priority. Does the routing of I-69 through Mississippi (and Arkansas and Louisiana) need to be revisited? I don't see how the L-shaped routing through MS and AR helps national traffic other than local communities. It really needs to be more diagonal between Memphis and Shreveport to be worth it. Therefore I'd have a bridge further upriver of Benoit. There is really nothing new in the summary, but it does emphasize that SIU 12, which includes the Great River Bridge/Charles W. Dean Bridge, is essentially ready for construction if federal funds become available in the future, whereas SIU 11 would need more preliminary work to be completed before construction could begin. I believe that Arkansas City was one of the original proposed crossings, but was rejected due to wetland impacts. Benoit was a compromise that everyone could accept. It would have made more sense to follow the US 79 corridor (in conjunction with possibly improving the river crossings at Memphis). Less stairstepping makes for a shorter distance. Less stairstepping makes for a shorter distance. Some 100 Star Landing residents and landowners were specifically invited to a recent public session in Southaven on the Star Landing Corridor. Public comments will be incorporated into an environmental assessment that’s required by the federal government for the county and state to obtain funding for corridor work, a county priority being assisted by MDOT. The study cost is about $700,000, obtained from federal sources; further steps in the process, including any eventual construction, will cost millions and have yet to be obtained. DeSoto County has been identified as one of Mississippi’s fastest-growing counties, and early studies for the Star Landing project envision an eventual scenic route from U.S. 78 in the east to U.S. 61 in the west that could help deliver more than 11,000 jobs and about $1.2 billion annually in economic development. This vision poses a landscaped parkway of 22 miles, capped by a diamond-type interchange at I-55. It would make more sense to number US 79, US 59. I doubt I-69 will ever be completed in MS.
As recently posted in the Interstate 269 thread, all of I-269 (I-69 SIU 9b) is now under construction. Paving contracts are yet to come, but completion is now in sight. The completed I-69 SIU 10, in addition to being part of I-69, could alternatively be viewed as an extension of the I-269 "half-loop" around Memphis .... which leads to the question of when, if ever, Mississippi will begin work on SIU 11. With Arkansas not doing much on I-69, Louisiana doing even less, and Tennessee waiting for federal funds for SIU 8, will Mississippi be able to justify construction on SIU 11 in the absence of significant progress by the nearby states? It should be an interesting political process. That probably includes new I-69 construction from Robinsonville to Benoit. Pretty much every other state is going through the same issues since they rely on taxes on gasoline which generally haven't been raised to keep up with inflation. They're going to need to find funding for both maintenance on existing roads and construction of new roads. If they find enough money, it could actually make I-69 more likely to happen (as Indiana has done with Major Moves & Major Moves 2020). However, it looks like there are plans to add lanes to I-55/I-69 from MS 304 to MS 302. 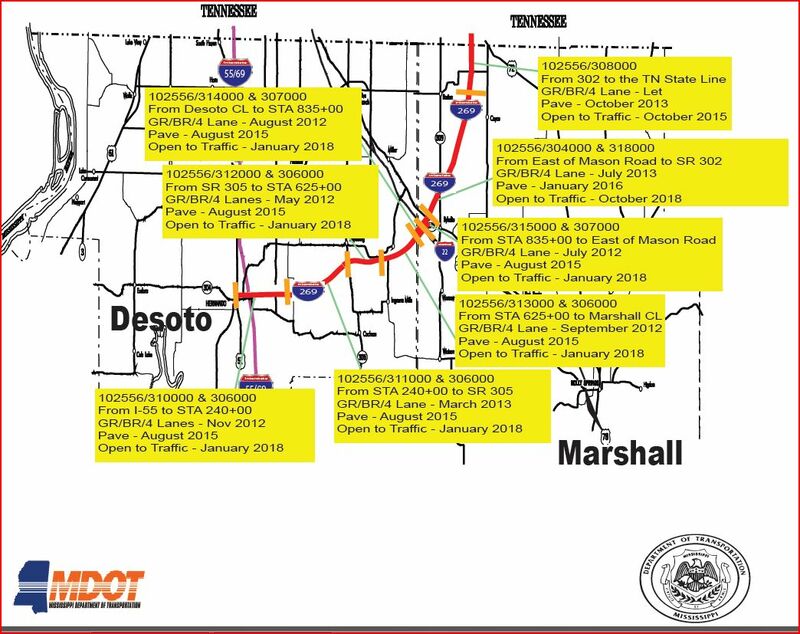 Looks like MDOT really wants to get I-10 widened through most of the state. What project are they referring to with the I-59 interchange at MS 42? There is already an interchange in place there.